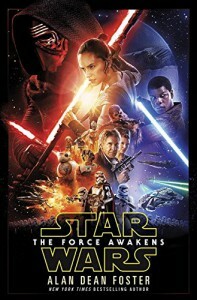 STAR WARS: THE FORCE AWAKENS by Alan Dean Foster is the seventh book in the Star Wars: Novelizations series. It is the start of a new saga within the Star Wars universe, and is based on the events of the film. The story begins years after the events of Return of the Jedi with the return of some familiar faces, as well as the introduction of some new characters. This is not typically a book I would pick up, but I really enjoyed the film on which this book is based and I heard that the book provided some extra details. Intrigued, I picked this book up and decided to give it a try. I prefer the film rendition, but I have to admit that I really enjoyed this book. It does provide some information that I didn’t get from the film, as well as a few new scenes, and I think it really helps to gain more insight into the events and characters of the film. As far as general storytelling goes, I found the book to be a quick fun read. I did find it difficult to connect to the characters, but I did also really enjoy the story. If you’ve watched the film, then you will not be surprised by the events of this book. Foster stays pretty close to the films storyline, and only occasionally adds an extra scene to give context to the narrative. I really appreciated the extra detail to the story, as it answered a few questions I had from the film – which is why I wanted to read the book. STAR WARS: THE FORCE AWAKENS plot wise is exactly what I would expect from a book (or film) in this saga. There’s mystery, and intrigue and some bursts of humour to break up the tension. Foster does a good job setting the stage, and introducing new characters in this book. In this book we are introduced to five new main characters, all of whom I thought were quite interesting. Rey is a nice, strong female lead that can take care of herself. Poe seems very competent. Finn is an interesting character who grows a lot through the book. Kylo Ren and Hux were complex characters, and I actually preferred the Kylo Ren of the book to that of the film simply because in this format it is easier to get inside his head. Then of course there is the return of some familiar faces, which I really enjoyed. Overall, I think STAR WARS: THE FORCE AWAKENS by Alan Dean Foster is a nice solid book. Although the plot of the book is pretty much the same as the film, so if you read/watch one first you spoil the other, I do think that is a good addition to the series.